Why you should pay more attention to Chinese outbound tourism in 2019? At years end we would like to look back at the evolution of Chinese outbound tourism and provide you with also with some insights about the future development. Between 2000 and 2018 the Chinese outbound tourism market grew from 10 million to 150 million tourists. Since 2012 China is the world’s largest source of outbound tourists. This impressive growth can be related to the further improvement of income and a relaxation of visa regulations both in China and in many host countries. Chinese people are also quickly changing in their travel habits and want to discover foreign countries and famous locations abroad. Only 7 percent of the Chinese population have a passport in 2018 that allows them to travel overseas. We can expect that more Chinese people will apply for a passport in the future. Given the large population, an increase of the share to 10 percent in the next few years would translate into number of about 40 millions more potential tourists. Entering the market now allows European companies to participate in the fast growth momentum and position their businesses as a must go highlight for Chinese outbound tourists. The future growth potential of the market is high and your business outlook is very promising. 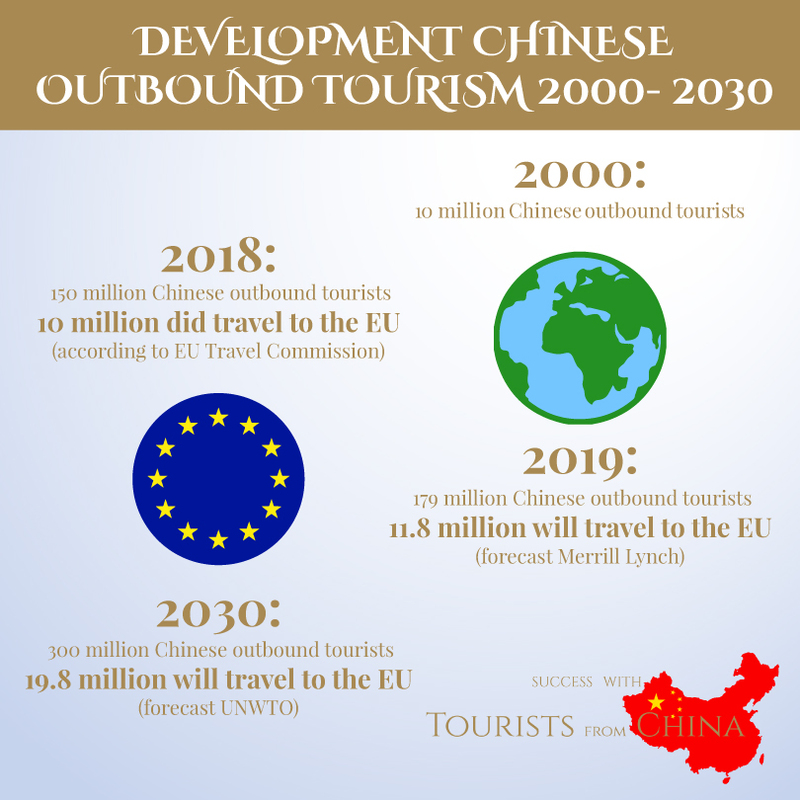 Have a look at the long-term forecast for the development of Chinese outbound tourism till 2030. With Chinese people becoming more cosmopolitan and wealthy we expect a strong long-term outlook for business opportunities of tourism-related companies in Europe. Take the chance to enter the market now and explore the huge opportunities! Be prepared and enter the market with the right strategy. We will be pleased to support you with our offerings! You can book your free discovery session here. Chinese Outbound Tourism in 2019: What Do We Expect? We see that the year 2019 offers huge market opportunities. Therefore, we would like you to be well prepared to enter the market. Here are our insights about the major market trends that we are happy to share with you. 1. The structure of the Chinese outbound tourism market is rapidly changing. We see an increasing number of individual and sophisticated Chinese tourists coming to Europe. This market segment is an interesting one for you. Individual tourists have a much higher spending power than the average tourist. 2. More Chinese individual tourists mean stronger demand for high quality luxury products. Hotels have to be prepared for the demand of high quality accommodation. In addition, the demand for high quality services will rise, including chauffeur service and concierge service. 3. The new market segment is more interested in local culture, including local food and festivals. Individual tourists are more adventurous and strongly appreciate beautiful landscapes. This means new opportunities for tourism-related companies outside of the beaten track and large cities. Businesses in smaller cities can increasingly participate in the potential of Chinese outbound tourism. 4. New travel destinations within Europe will become popular among Chinese tourists. We expect that Eastern and Northern European countries will be able to attract more Chinese tourists. For tourism-related companies in these countries that means that Chinese tourists will become a new market segment. 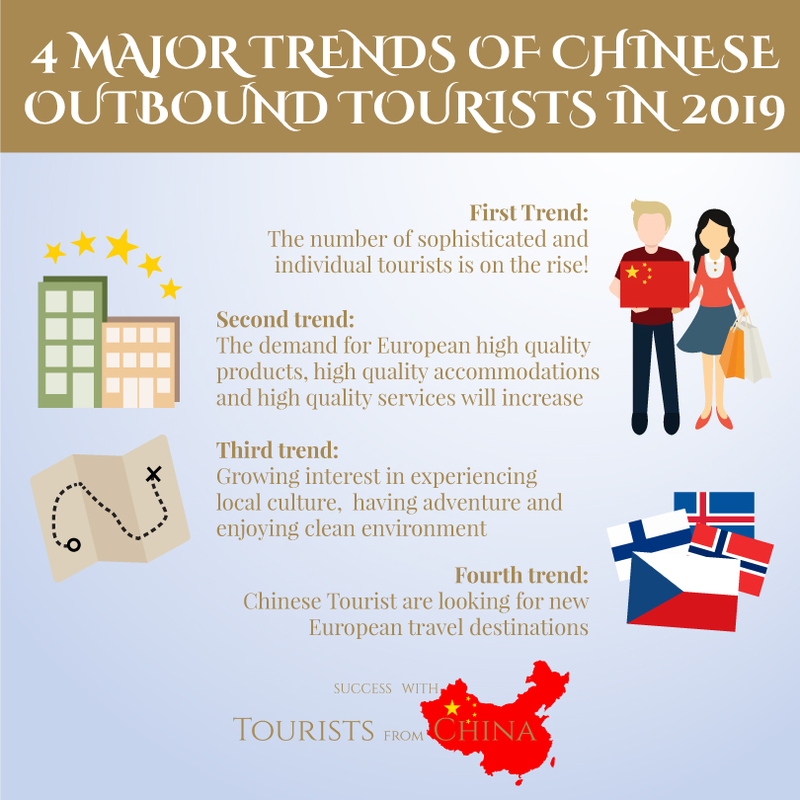 In sum, these four trends show that Chinese outbound tourists are developing into an even more interesting market that deserves your attention in 2019! Do you know that that the Chinese outbound tourism market is still in the infant stage? Do you know that Chinese individual tourists are especially an interesting targetgroup for high quality product businesses? « #9 WHICH SOCIAL MEDIA TO USE TO BECOME VISIBLE FOR CHINESE TOURISTS?